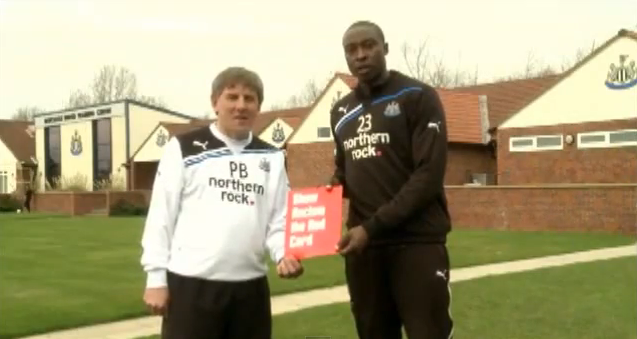 Show Racism the Red Card - Do you support our anti-racism message? Pass it on! Do you support our anti-racism message? Pass it on! Earlier this year students at Northumbria University produced two short films for Show Racism the Red Card. The films are designed to promote the campaign and a positive anti-racism message. The students involved in making the films were Oliver Bingham, Allan Beaton and Benjamin Alldridge. 'Pass it on' and 'Whoever, Wherever' have now been added to our YouTube channel. 'Pass it on' features appearances from Newcastle United FC players Shola Ameobi and Steven Taylor and NUFC legend Peter Beardsley! Music for the films was provided by the bands Snow Patrol & Two Door Cinema Club. SRtRC Chief Executive Ged Grebby said "The short films produced by the students at Northumbria University are fantastic and a great way of spreading the Show Racism the Red Card message. I would urge everyone to watch and share them. A big thank you to all of the students, Northumbria University, Snow Patrol and Two Door Cinema Club for their support!"